2 Bedroom 2 Full Bathroom Jacuzzi Tub, 2nd Floor, Amazing Gulf Front Views! The PALACIO- LUXURY Resort living at its best! AMAZING unobstructed views overlooking the crystal white sandy beaches and sparkling emerald waters from the master bedroom and private balcony!! We just completed NEW DECOR with upgrades throughout the condo. New paint, accessories, artwork, furniture, lighting, range with smooth cooktop and much more! Unwind and relax on your covered private balcony while sitting on our loungers watching the waves of the Gulf of Mexico cascade onto the power white sandy shore! Wake up in a comfy king bed in your master suite which features a large, glass window from ceiling to floor boasting mesmerizing gulf views. The second bedroom is furnished with a queen bed with a premium mattress. The living room has a New high end Pottery Barn Queen sofa sleeper with memory foam. Also in the living room there is a New black, leather Full size sofa sleeper with blow up mattress. This spacious condo will accommodate up to eight people with ease. Enjoy delightful amenities including new 55" TV, free wireless internet and a front loader full size washer and dryer in your condo. The kitchen is fully equipped with appliances, cookware and spices. Guests have the option to work out in the fitness center, play tennis on two of our secured tennis courts, relax in our (seasonally heated) large outdoor pool, swim laps in our heated lap pool, grill burgers on one of our poolside charcoal grills, or just unwind in the outdoor hot tub. You can even rent our social room with stunning floor to ceiling views of the Gulf and pool area for your private event! Enjoy the use of complimentary Wi-Fi connection in your condo, lobby, or social room, DVDs & closet full of board games, HUGE deck box full of fun sand toys and complimentary beach chairs and umbrella rental while soaking up the sun! All linens INCLUDING BEACH TOWELS are provided for your comfort. Many fun Activities in this area! We will provide a personally written local guide with valuable information such as top restaurants, fresh seafood, fishing charters, grocery stores, shopping, kids activities and much more. Perdido Key beaches have been rated among the TOP 5 island beaches by Conde Nast Traveler. One aspect that sets it apart-the beautiful & unspoiled FL district of the Gulf Islands National Seashore **Great BIKING & PICNICKING**, which houses 5 miles of protected dunes harboring a vast array of wildlife,some found only in and around the barrier islands. Perdido Key is surrounded by water with the Gulf of Mexico, Old River & the Intercoastal Waterway-The views are breathtaking! Full Size Front Loader in condo! Fully equipped with many extras! All The Extras!Toaster, Toaster Oven, Blender, Keurig, Coffee Maker, Ice Tea Maker, Crock Pot. Table can seat either 6 or 8 people. Ends on both sides of the table slide out for the extra seating. 2 Extra chairs are in the closet in 2nd bedroom. New balcony Furniture. 2 Chaise Loungers, Deck Box full of Beach Toys &Floats, Rolling Cooler, Beach Chairs! Beautiful, Large Gulf Front Pool AND separate Heated Lap Pool! Luggage carts, On-site management office, Conference room. We have stayed at Dianne’s Palacio condo for years. She always takes care of you and is so easy to work with. The condo is equipped with everything you’ll need for your stay. Because it’s on the second floor, you’re steps away from the pool and beach, hard to beat that! Thank you, Dianne, for providing detailed answers to all of our questions and for being so prompt. The condo was extremely clean and the view was breathtaking!! We visited during the winter season but we still found a lot of fun activities to do. We are always searching for a new place for our annual family vacation and we have definitely found the condo that we would like to return to in the summer and fall. The pools and hot tub were impeccable. We also liked the fitness center and grills. But the best was the fact that in a few steps after leaving the elevator, you were at the pool & beach! This made it one of our most memorable vacation spots. Everything provided in the condo was above and beyond our expectations. The towels were large and luxurious. And having the big beach towels was a plus since we were short on space in our vehicle. There are many extras here, too numerous to mention. Outstanding! Beautiful views and well stocked condo. The heated pool and hot tub were out of order for 4 or 5 days, so in late October that was aggravating. The new sofa is miserable to sit on and the sling chair is only good for children or small adults. The living room furniture is arranged so that the view when seated is away from the windows and ocean view! The beds and the balcony table and chairs are comfortable. I enjoyed the trip and may return to this condo. Definitely will return to Perdido Key. We had a wonderful time. Condo had everything we needed. Condo was clean and perfect for our family of 5. We would love to stay here again. The property was very nice and spacious - I also love the location. I enjoyed the pool and beach, it was nice having the beach chair set up everyday. Also very easy to walk across street for dinner. We did have an issue with some building noise, but that was not the property owners fault. The property owner still offered to let us stay another night for any troubles that we had. That was extremely nice of them. 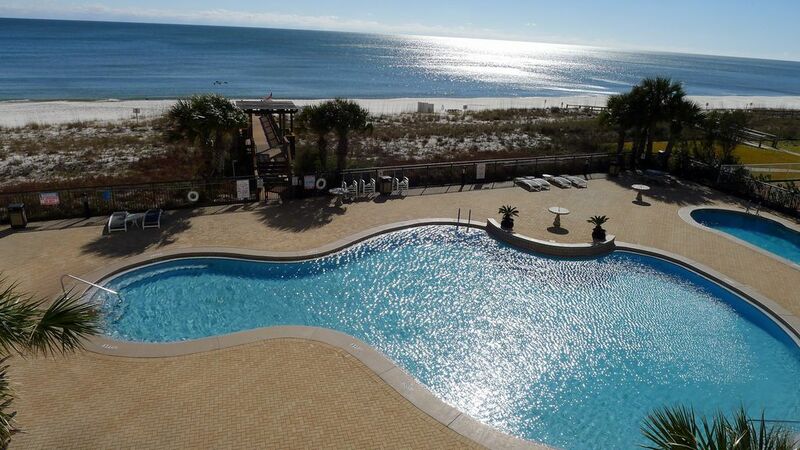 I will definitely book again in the future when I plan on returning to Perdido Key.